Two different covers, the same great book! This is the smallest book I have written but it might be my favorite. Chocolate is near and dear to my heart and there is so much to share about this delectable, healthy food – you have heard about antioxidants in dark chocolate, haven’t you? Looking at fancy truffles in a chocolate shop you wouldn’t believe how easy they are to make. This book explains everything you need to know, from choosing chocolate, to properly melting and tempering chocolate to making the most perfectly balanced ganache centers. Some recipes you will find: Bittersweet Chocolate Truffles (as well as Milk and White), Chestnut Milk Chocolate Truffles, Caramel Bittersweet Truffles with Fleur de Sel, Matcha White Chocolate Truffles, Hazelnut Praline Milk Chocolate Truffles, Milk and Honey Truffles, Bittersweet Truffles with Black Currant Påte de Fruit (50 in total) and for the daring, be sure to try the Chile Cinnamon Dark Chocolate Truffles – the tiny bit of heat from ancho chile and cinnamon is fabulous! Lots of great basic chocolate information as well. 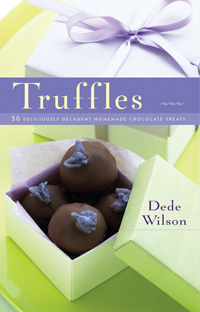 The best tip I can give you when working with this book is to use the recommended chocolates for each recipe. Substituting other chocolates will vary the flavor and most certainly alter the texture – and not usually for the best. Recipe with so few ingredients truly depend on your attention to detail.